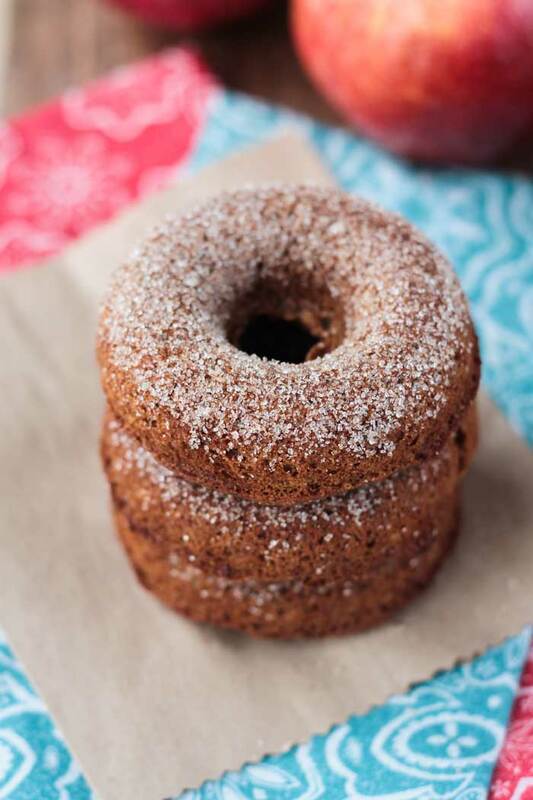 Baked Apple Cider Donuts – Soft, fluffy, moist baked donuts with all the flavors of fall. Dairy free, egg free, and oil free!! Trust me, you are going to love these! Ok, technically it’s not really. But the temps are slowly dropping. The humidity is starting to decrease. Football season is going strong. The apple orchards are open. And I’m ready. Bring on all-the-apples and pumpkin-all-the-things. 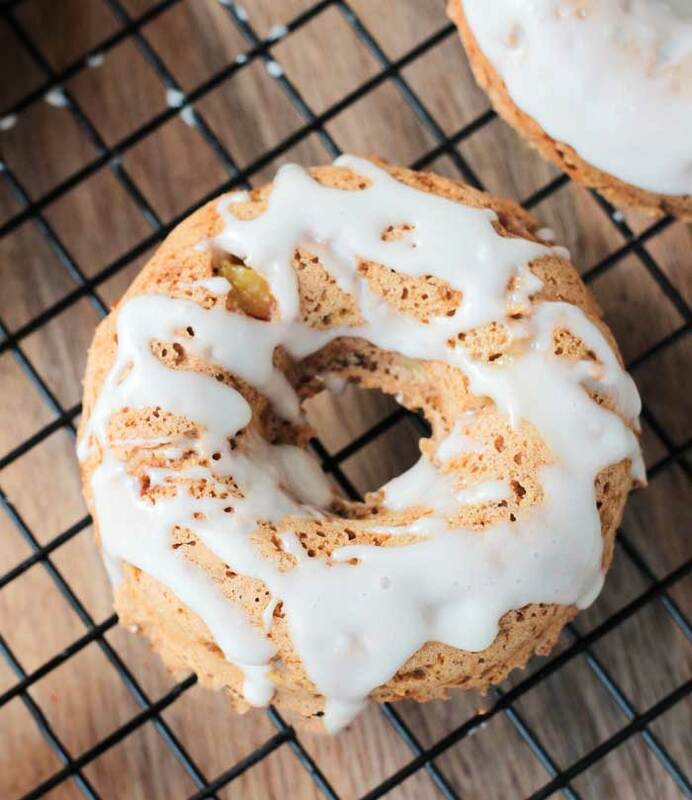 You’ll be seeing quite a few yummy treats here and I’m starting with these amazing Baked Apple Cider Donuts! I look forward to fall every year. The beautiful colors. The crisp, cool air. I wish it lasted longer. 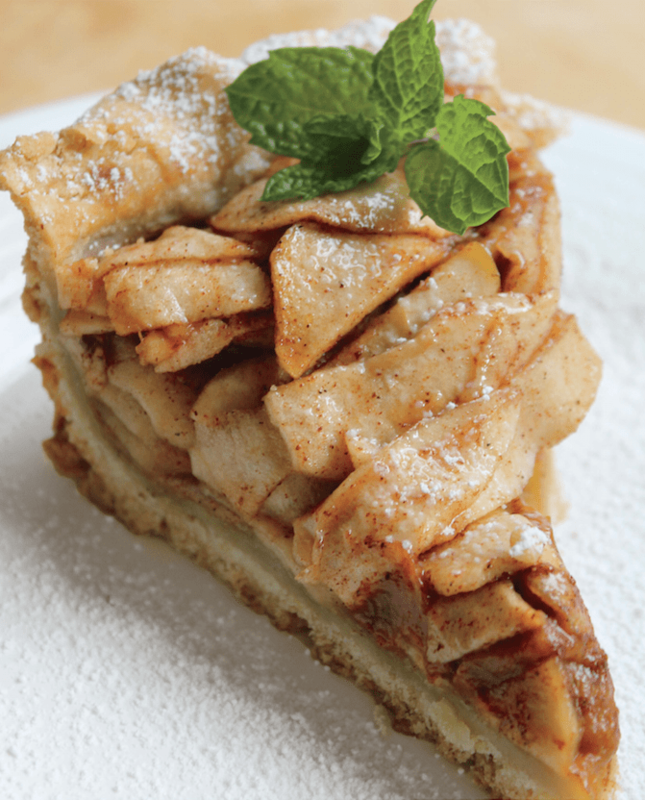 One of our favorite things to do in the fall is to visit the local apple orchards. We are lucky to have so many options in our area. Whether we pick our own apples or buy them pre-picked, we always come home with a peck. And you know what else we always come home with? Apple Cider Donuts! They are always freshly made and still warm. The donuts are light and soft and, of course, coated in the signature cinnamon sugar mixture. 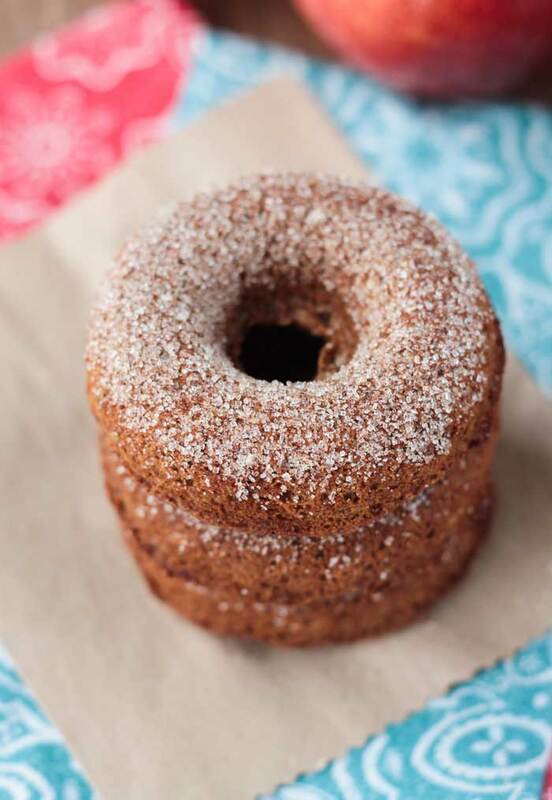 This year, I decided to try my hand at making a healthier apple cider donut. And, holy wow, did I succeed! I’m not trying to fool anyone – these Baked Apple Cider Donuts are not health food – they are sparkling with sugar after all. But, they are a healthier option than what you’ll find at your local apple orchard. They are dairy free, egg free, soy free, and oil free! The batter is refined sugar free. And, the donuts are baked, not fried. Best of all, they have that light, melt-in-your-mouth texture that you expect from these fall sweet treats. I think I lost count on how many different batches of these donuts I made. I was adamant about getting the perfect soft, moist texture. I had neighbors, friends and family all try them. 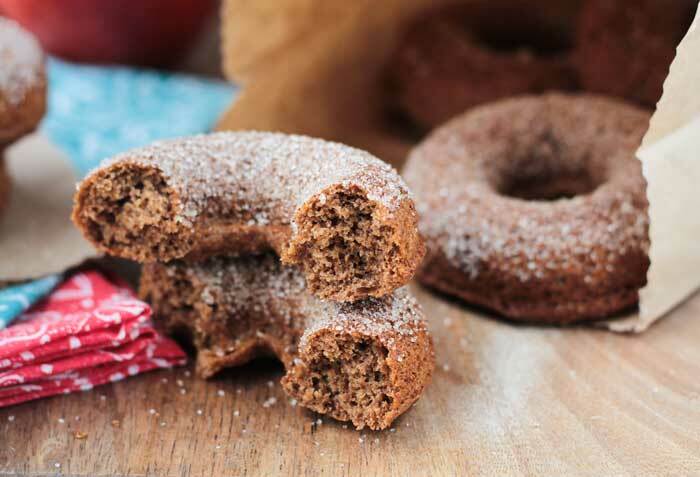 These Baked Apple Cider Donuts received two thumbs up from some of the pickiest eaters – even those that get a bit squeamish around healthy food. I promise you guys are going to love these! 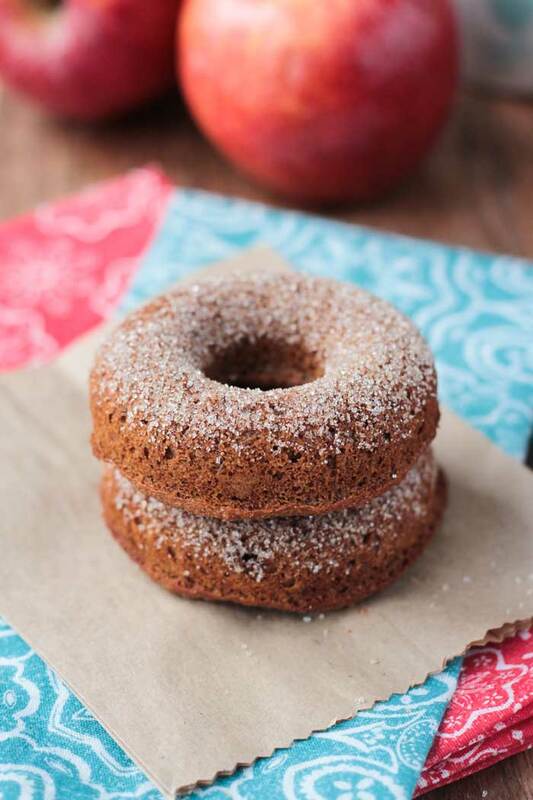 I can not wait for you guys to try these amazing Baked Apple Cider Donuts. I love hearing from you, so please leave me a comment below with your feedback and star rating. You can also find me on social media. Let’s see those remakes! Be sure to tag me @veggie_inspired and #veggieinspired so I’m sure to see it. Happy baking! Soft and fluffy Baked Apple Cider Donuts made with NO oil, NO eggs, and NO dairy. You won't believe how good these are! A few tbsp organic cane sugar mixed with 1/4-1tsp of cinnamon. Lightly spray a 6 cavity donut pan with cooking spray and set aside. In a large mixing bowl, whisk together the flour, sugar, baking powder, baking soda, salt, cinnamon and nutmeg. In a large measuring cup, whisk together the apple cider, coconut milk, applesauce, and apple cider vinegar. Pour the wet ingredients into the dry and mix until just combined. The batter might seem a bit wet, but don't worry - this is going to keep the donuts soft and moist. Spoon the mixture into the prepared donut pan. Fill each cavity just to the top, but don't overfill. Bake the donuts for 11-13 minutes, until a toothpick comes out clean. While the donuts are baking, mix together the sugar and cinnamon for the topping and set aside. When the donuts are done, let them cool in the pan on a wire rack for just about a minute or two - until you can handle them without burning yourself. They should slide easily out of the pan. Immediately dip each one into the cinnamon sugar mixture while they are still quite warm and return to the wire rack to continue cooling. These are really best eaten the day of. If you must keep leftovers, store them in an airtight container and warm in the microwave for about 10 seconds when ready to eat. We LOVE these! That sugar coating is the best. And the donuts came out perfectly moist and “apple-y!” We will definitely make these again for fall!!! Thank you, Sarah! It’s just not fall until the apple cider donuts come out! Can’t wait to make more this year! We just got a donut pan, and these were the first donuts we made in them. They came out PERFECTLY! Shared them with omni neighbors, and they all loved them, too. Oh, I’m so glad to hear everyone loved them! I have a feeling that donut pan is going to get a lot of use going forward! Hi, Julie! Although I haven’t tried, I suspect they would work just fine in a muffin tin. You might have to bake them an extra couple of minutes. Just check them for doneness in the center and they should pull away from the tin easily. Let me know how they turn out. Enjoy! Thanks, Sina! I wish fall lasted longer. For some reason, it’s back in the upper 80’s again this week. And I know all too soon, it will be in the negative digits. Yuck! I would love fall weather all year! Thanks, Nadia! I don’t love traditional donuts either – WAY too sweet. I hope you get a chance to try these. I think you’ll love them. I haven’t had a donut in years! These look really delicious! These donuts look amazing! They’re perfect for fall! My favorite time of year – and I need sweets to celebrate! 🙂 Thanks, Taylor! These are perfect for fall! They look so delicious! Fall is the best! Thanks, Lindsay! Everytime I see these donuts I drool! They look so amazing, its hard to believe they are made of nutritious ingredients too! These look so good! They are one of the things I missed most from the apple orchard. I tried to make baked apple cider mini donuts in the past but they don’t look nearly this good. We just went to the apple orchard last weekend and if I had spelt flour I would be making these tomorrow morning to enjoy on the sidelines of the soccer field with my coffee and fuel the girls games! Thanks, Sarah. I did test them with white whole wheat and they were good, but a little more dense than I wanted them. I would definitely hold out for the spelt! 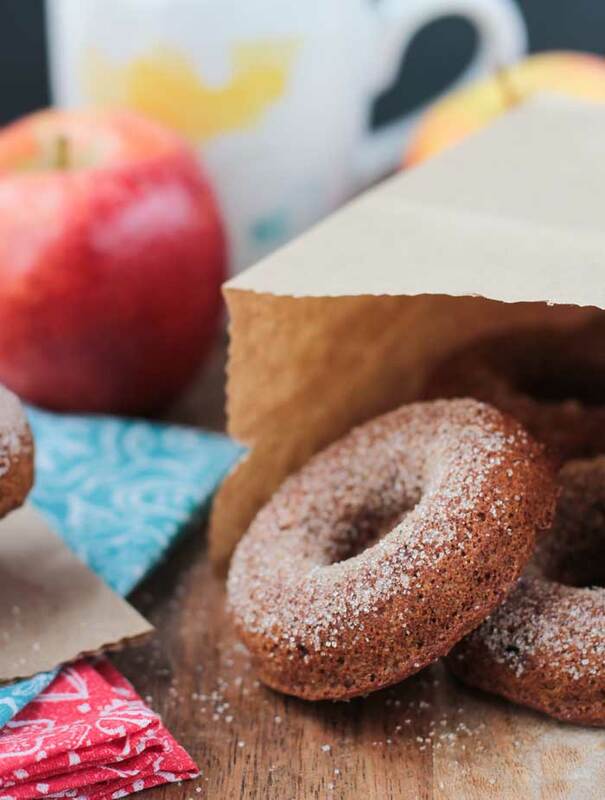 Apple cider donuts remind me of cool fall days spent apple picking! Love this healthier version! Yes! Those are the best days! Thanks, Laura! I am SO ready for fall!!! It doesn’t feel like it yet here, but I’m already seeing some of the leaves changing and I’m excited! Jenn, these donuts look amazing!!! Reminds me of our trips to Long Grove to grab hot apple cider and donuts as a kid…I miss that! These look just like them, but without the grease and refined sugar 🙂 Hope you have a great weekend! Thanks, Mandy! It seems these donuts are conjuring up memories of childhoods everywhere. I love that! Even though I don’t think I ever had an apple cider donut as a kid. Now, in my adult life, I’ve eaten probably a few too many. Thank goodness for a healthier version now. And, yes, bring on the beautiful fall colors! I just saw these on your IG last night and commented how I just got a big jar of apple cider vinegar! These look sooo good! I have never had apple cider donuts before, but I imagine the flavor is amazing. I love that you used spelt, too. I love using spelt, it can be a bit tricky to work with, but it definitely makes things so soft! I love all that sugar on top. I like sweet donuts, don’t give me healthy boring ones, no thanks! HaHa! Thanks, Brandi. Yes, these might be healthier, but they are still a treat for sure. I go through apple cider vinegar like it’s water. Love it to make super soft fluffy baked goods. And, I love spelt flour too. 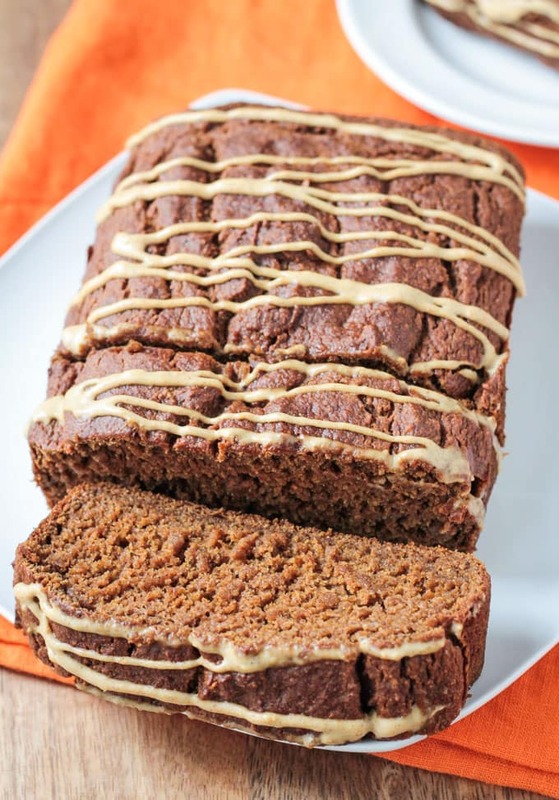 I did trial this recipe with white whole wheat and it was just too dense. I can’t believe these are baked , the texture is perfect and they look delicious.When I made baked doughnuts mine all dried out. These donuts look amazing. They are so beautifully shaped and look so perfect in texturetoo. I tried baking donuts and mine dried out. Thanks, Nayna! The batter needs to be pretty wet so they don’t dry out. And the combo of baking powder, baking soda and apple cider vinegar really give these a great airy texture inside. Let me know if you try it! They look so good and I love that you used spelt flour. It’s my favourite for baking! I recently dusted off my donut pan as I hadn’t used it in about a year and I’ve never had an apple cider donut. Having moved here from England it’s so fun to learn about all these new American/Canadian style recipes that I hadn’t heard of! I can’t believe they aren’t more of a thing in England as we make great cider! Yes, I love spelt flour too. It’s so light and soft. I did test it with white whole wheat too and it just didn’t do it for me. Too dense. So many things you need to introduce to your Egnlish friends! Thank you so much, Julie! Definitely healthier, though still a treat! I have such good memories of eating apple cider donuts after picking apples with my family when I was a kid! Can’t wait to try these with my boys! Aw, such great memories. I don’t ever remember eating an apple cider donut as a kid, but I have enjoyed plenty as an adult 🙂 Glad to finally have a slightly healthier version. I just bought my donut pan over the summer and I’m so obsessed with it! I hope you love them, Alisa! These look ahhmazing! I’ve never made donuts before so I am going to have to try! Thanks, Maria! They are super easy to make! I hope you love them! I just want to kiss people who can come up with healthier and dairy free desserts!!! I love this idea and the flavors would be a big hit around here! HaHa – pucker up! 🙂 Thank you, Amanda. I can’t even count how many batches I made to get them just right. It was worth it in the end! Thanks, Melissa! They are going to be in heavy rotation in the fall around here! I’ve been loving fall more in the last few years. It’s so hot during the summer so it’s nice to get some cool weather. Fall is the best! I love everything about it (except for the fact that winter comes next). Thanks! WOAH these look amazing. Reminds me of this place in Virginia that had apple picking and the BEST donut stand! I’m dying to make these myself. I know apple cider donuts are a huge thing during the fall, but I’ve actually never had them, because I’ve never seen a vegan version. I need to try these! Is there any way you can make these diabetic, paleo, gluten intolerant, and raw friendly? Hahahaha!!! But really though, I’d shove these all into my mouth without even thinking twice. SO yum! HaHa! If only it was that easy, right?! Thanks, Sophia! Shove away! These look amazing! I usually am not in a rush to get to fall, but this summer has been a beast. Bring on the fall flavors and the cooler temps! NO to Fall, but I’ll gladly take all the seasonal food goodies while basking in the summer sun instead 😉 We can have it “all” right? Haha! 🙂 Well, I would eat these in any weather, but I’m definitely ready for some cooler temps (just not winter-like temps! ).